As is clear by now I’ve been digging into ancient coins lately and I found these very interesting examples of Roman coin depicting Armenians and Armenian symbols. It is always curious to see how Armenians were portrayed by others in the ancient times. I wander if other nearby empires (maybe the Persians) have struck coins depicting Armenia, Armenian people or Armenian symbolism. maybe something for another post. Roman Silver Denarius of Augustus (27 B.C.E.-14 C.E. ), in Commemoration of the conquest of Armenia. On the reverse an Armenian Archer, standing facing, holding spear in right hand and resting left on a bow set on the ground. Notice the Mithraic cap he is wearing. Left portrait of Antonino Pio AD 138 -161, right: Armenia seated on the ground in attitude of mourning. Left portrait of Lucius Verus AD 161-169, right: Armenia seated on the ground in attitude of mourning; in the background, shields, vexillum, and trophy. 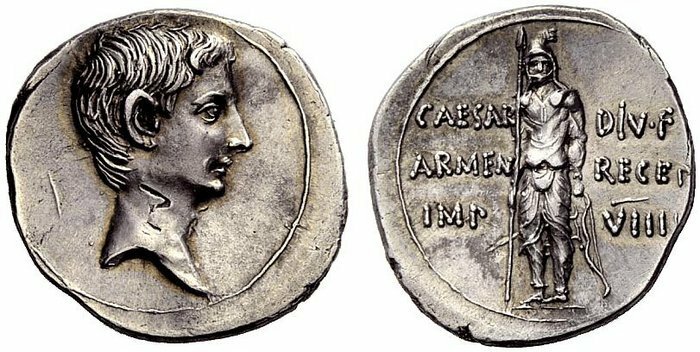 Trajan in military attire standing, holding spear and parazonium, at his feet are the reclining figures of Armenia symbolically placed between Euphrates and Tigris (as a geographic reminder) reffering to anexation of Armenia. Roman Silver Denarius of Augustus (27 B.C.E.-14 C.E. ), Commemorating victory over Armenia, with symbols of Armenia: an Armenian Tiara with Bow quivers. Roman silver Denarius of Mark Antony (37 BC. ), with the Armenian Tiara over bow and arrow on the revers. Struck in honor of Marcus Antonius’s general Canidius Crassus, who in 37 BC defeated Artavasdes of Armenia. The Armenian tiara as well as bow and arrow are both ancient symbols of Armenia. Roman Gold Aureus of Augustus (27 B.C.E.-14 C.E. ), Struck in 19 BC, in celebration of victory over Armenia (Armenia Capta) Victory cutting the throat of a bull. Imagery reminiscent of the deity Mithra (that has been venerated in ancient Armenia). Roman Gold Aureus of Augustus (27 B.C.E.-14 C.E. ), Struck in 19 BC, in celebration of victory over Armenia (Armenia Capta) Roman Gold Aureus of Augustus (27 B.C.E.-14 C.E. 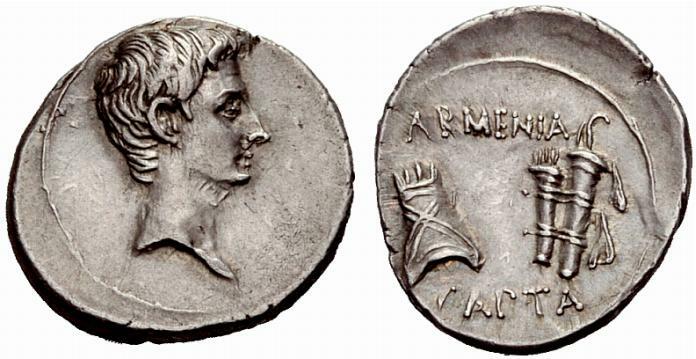 ), Struck in 19 BC, in celebration of victory over Armenia (Armenia Capta).Victory cutting the throat of a bull. Imagery reminiscent of the deity Mithra (that has been venerated in ancient Armenia).